We generally don’t cover a whole lot of comedy around here (with the exception of musical comedian Reggie Watts) but Tig Notaro’s talent and mission to raise funds for Breast Cancer Awareness is a story we simply had to feature. Tig Notaro grabbed my attention back in December while closing out an episode of CONAN with her ‘Stool Sounds’ routine, one of those rare late night t.v. moments that really sticks with you – this was anything but your run-of-the-mill stand-up bit. After a few jokes and a hilarious “sigh” theme, Notaro simply (and slowly) dragged a stool around the studio for about five minutes, inciting uproarious laughter from the crowd but most notably, from the host and sidekick Andy Richter himself. When CONAN is digging a guest or musical / comedy act in the studio it’s easy to see his genuine enjoyment when it goes above and beyond his general enthusiasm. Without question, Coco’s got a better eye than perhaps anyone after nearly 20 years as a late-night television host. He knew it, everyone watching seemingly knew it and the crowd response illustrated: a comedic star was being born that night. The routine reminded me of something the great Andy Kaufman maybe would’ve done. Simple in formula, sneakily complex and edgy as hell. Sometimes the aim to avoid laughs are the most memorable and hilarious routines of all (see Norm Macdonald’s purposeful bomb at Bob Saget Roast). The ability of a comedian to make a crowd slightly uneasy and keep them laughing is a rare talent and that’s what got me about this performance. Looking at things on the surface, when someone tells you they just saw a comic drag a stool around for five minutes, it doesn’t exactly sound funny but Tig’s deadpan, never-broken gravamen during delivery sets her apart. This skit stuck with me and when I saw that the comic would be appearing at this year’s Outside Lands Festival in SF, I had the set circled on my show calendar. Just before the festival, I saw the sad news that Tig would have to cancel her appearance because she had just gotten her breast cancer diagnosis. The comedian’s prognosis seems sunnier and more hopeful now, but the unbearable pain she must’ve endured during the period (read further below) in August is hard to imagine. Notaro has decided to raise money for Breast Cancer Awareness and has received the support of her friend Louis C.K. So hopefully you’ll read this post, check her out and put down $5 towards her new LIVE album. Read on for more info, Tig’s amazing story and check her out. Tig Notaro’s new album LIVE (as in “continue to live”) is out today exclusively in digital format via Louis C.K.’s website for $5. Part of the proceeds from this record will go to breast cancer research, in conjunction with October being National Breast Cancer Awareness Month. Pick up your copy right HERE. Also happening today, a new interview with Tig and Ira Glass host of This American Life. You can check it out online HERE, and catch it on your local NPR affiliate this week at its regular broadcast time. Monday, Tig will be speaking with Terry Gross on Fresh Air, so stay tuned for that. 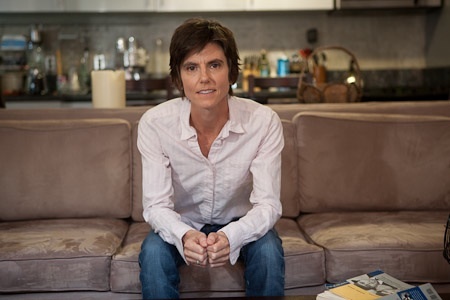 On August 3rd at Largo Theater in Los Angeles, Tig Notaro made a seemingly nonchalant detour in her stand-up routine to announce that she had breast cancer, just days after being diagnosed. Her blend of humor and matter of fact approach left comedy fans riveted, many in both tears and laughter. LIVE encompasses the previous four months of Tig’s life leading up to that night at Largo. Amidst a flurry of newfound success including performing her amazing “Taylor Dayne” bit on This American Life, national attention from The New York Times, Entertainment Weekly, Esquire and more, tragedy began to strike. Tig contracted a deadly bacterial infection that caused her to lose 20 pounds and be hospitalized for a week. Tig’s mother unexpectedly died from an accidental fall. She broke up with her partner. And then just a day before taking the stage at Largo, Tig was diagnosed with stage 2 bi-lateral breast cancer. This recording is a raw, real and insightful detailing of a human being and stand-up comic assessing a horrible set of circumstances in a calm, clever and clear manner. “In my 27 years doing this I have seen a handful of truly masterful performances. One was Tig Notaro last night at Largo” -LOUIS C.K. Continue to page two to read Louis C.K.’s recent message to fans about Tig Notaro.